Our Offices and Showroom will be closed from 5:00 pm Friday 22 December and over the Christmas and New Year period. We will reopen for business 9:00 am Monday 15 January. Orders can be placed online over this time, and your items will be held in our secure vault until we reopen Monday 15 January. There will be no vaulting fees incurred for orders placed during this time. We will contact you after 15 January to notify of when payments have been cleared and your items are available for collection or shipping. If you choose for your items to be shipped, please allow for extended delays during this time. You can also email us directly [email protected] The GBA team will be checking messages intermittently and will respond when possible. The GBA team will be checking messages intermittently and will respond when possible. 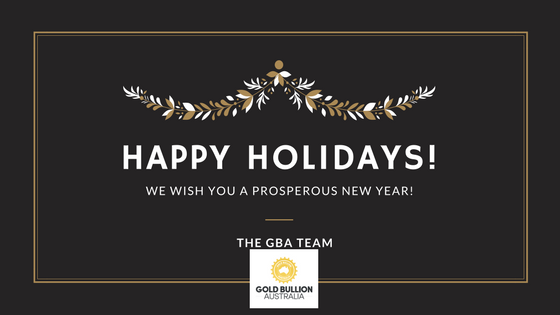 We have selected a few days when we will open in January to cater for clients wishing to sell back their precious metals. We wish you and your family a very safe Holiday, Merry Christmas and a prosperous New Year!